Confidentially Speaking: How Protected Are Your Claim Communications, Investigative Documents, Internal Procedures, and Settlement Agreements? Presented by: Fred Wood, John Reis, and Amber Duncan of Smith Moore Leatherwood, LLP, 101 N. Tryon Street, Suite 21300, Charlotte, NC 28246 and Tim Sparks of Sonic Automotive, Inc. © 2016 Smith Moore Leatherwood LLP. ALL RIGHTS RESERVED. 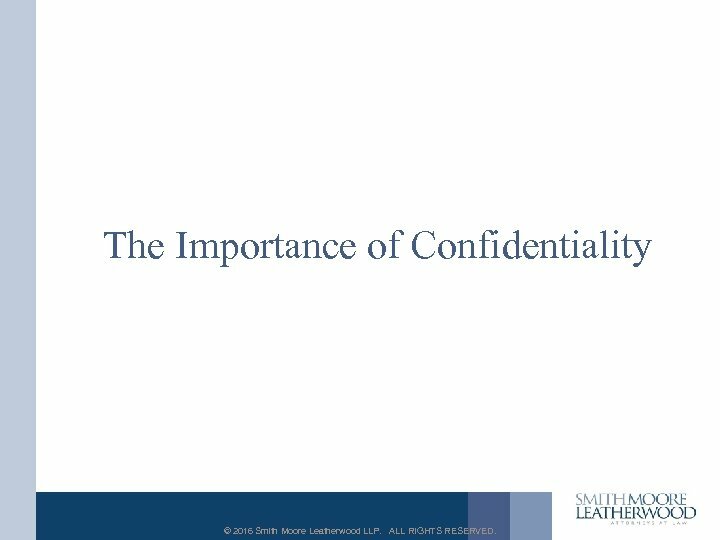 The Importance of Confidentiality © 2016 Smith Moore Leatherwood LLP. ALL RIGHTS RESERVED. © 2016 Smith Moore Leatherwood LLP. ALL RIGHTS RESERVED. What Are Some Things We Want to be Confidential? • • • Internal reports, memos, or emails to management on issues such as liability, coverage, and recovery potential. Your expert communications. Your attorney-client emails and letters. Communications with co-counsel. Communications with broker or agent. Internal claim-handling guidelines, practices, or procedures. Risk management materials. Confidential settlement agreements. Internal investigations. © 2016 Smith Moore Leatherwood LLP. ALL RIGHTS RESERVED. 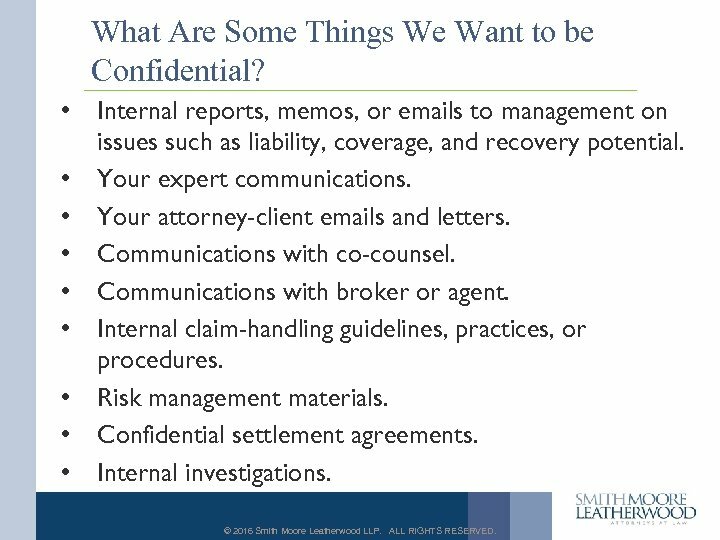 Types of Confidentiality • • • Attorney-client privilege Joint defense doctrine Work product doctrine Trade secrets Employer confidentiality agreements Settlement agreements © 2016 Smith Moore Leatherwood LLP. ALL RIGHTS RESERVED. 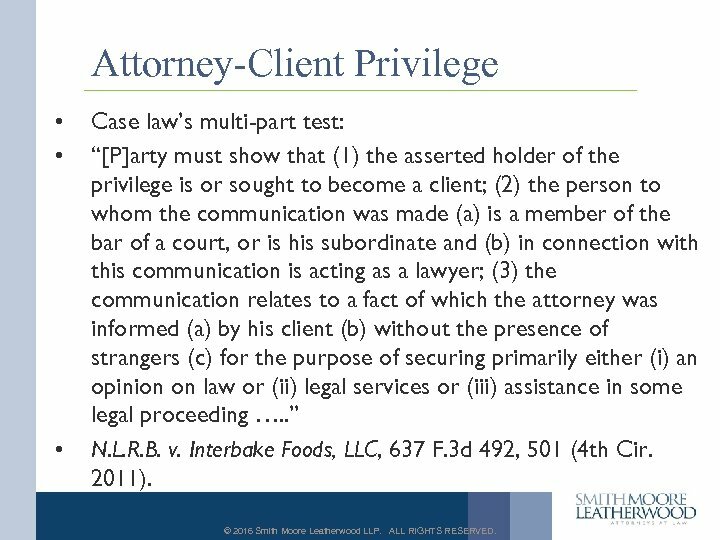 Attorney-Client Privilege • • • Case law’s multi-part test: “[P]arty must show that (1) the asserted holder of the privilege is or sought to become a client; (2) the person to whom the communication was made (a) is a member of the bar of a court, or is his subordinate and (b) in connection with this communication is acting as a lawyer; (3) the communication relates to a fact of which the attorney was informed (a) by his client (b) without the presence of strangers (c) for the purpose of securing primarily either (i) an opinion on law or (ii) legal services or (iii) assistance in some legal proceeding …. . ” N. L. R. B. v. Interbake Foods, LLC, 637 F. 3 d 492, 501 (4 th Cir. 2011). © 2016 Smith Moore Leatherwood LLP. ALL RIGHTS RESERVED. 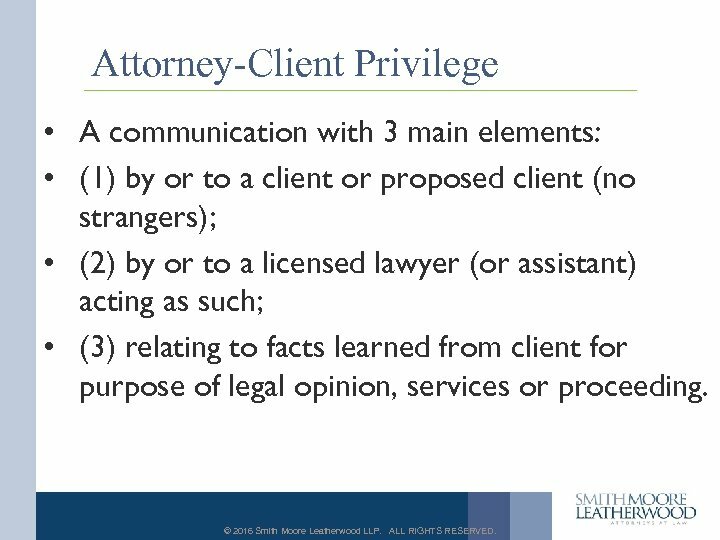 Attorney-Client Privilege • A communication with 3 main elements: • (1) by or to a client or proposed client (no strangers); • (2) by or to a licensed lawyer (or assistant) acting as such; • (3) relating to facts learned from client for purpose of legal opinion, services or proceeding. © 2016 Smith Moore Leatherwood LLP. ALL RIGHTS RESERVED. Attorney-Client Privilege • Not every communication between attorney and client is privileged. © 2016 Smith Moore Leatherwood LLP. ALL RIGHTS RESERVED. Example • Fourth Circuit: Privilege does not apply to communications in connection with a proposed public disclosure: – “If a client communicates information to his attorney with the understanding that the information will be revealed to others, that information as well as the details underlying the data which was to be published will not enjoy the privilege. " In re Grand Jury Proceedings, Thursday Special Grand Jury Sept. Term, 1991, 33 F. 3 d 342, 354 -55 (4 th Cir. 1994) © 2016 Smith Moore Leatherwood LLP. ALL RIGHTS RESERVED. Protective Measures • Copying your outside law firm on internal communications may not be enough. © 2016 Smith Moore Leatherwood LLP. ALL RIGHTS RESERVED. 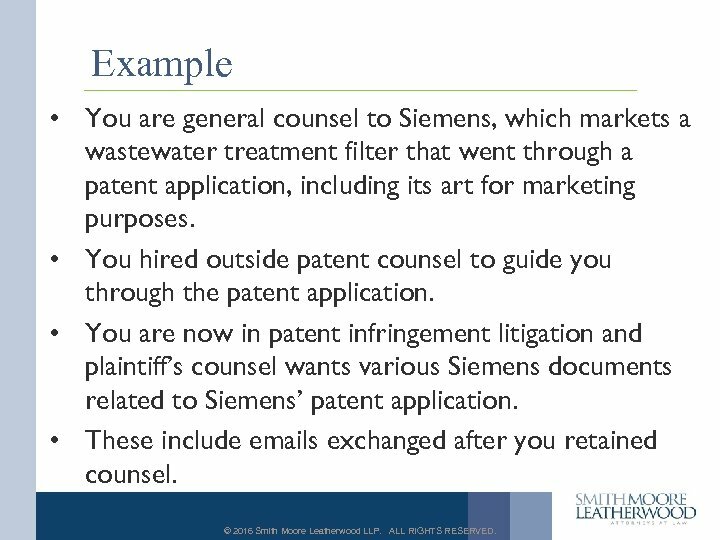 Example • You are general counsel to Siemens, which markets a wastewater treatment filter that went through a patent application, including its art for marketing purposes. • You hired outside patent counsel to guide you through the patent application. • You are now in patent infringement litigation and plaintiff’s counsel wants various Siemens documents related to Siemens’ patent application. • These include emails exchanged after you retained counsel. © 2016 Smith Moore Leatherwood LLP. ALL RIGHTS RESERVED. 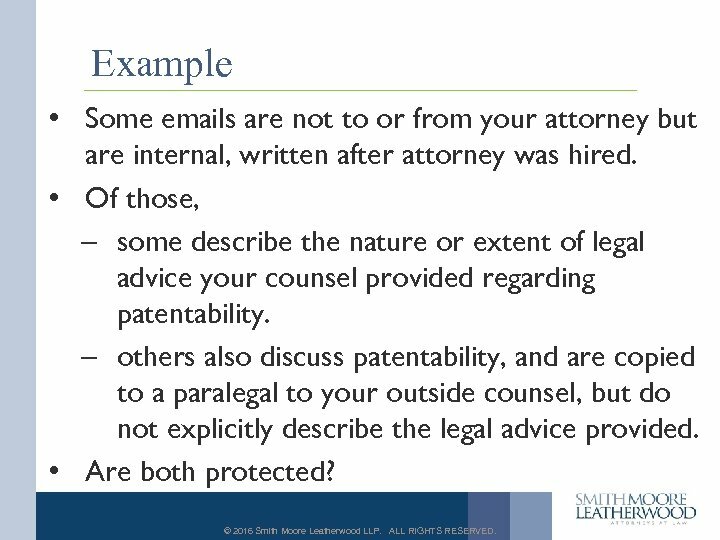 Example • Some emails are not to or from your attorney but are internal, written after attorney was hired. • Of those, – some describe the nature or extent of legal advice your counsel provided regarding patentability. – others also discuss patentability, and are copied to a paralegal to your outside counsel, but do not explicitly describe the legal advice provided. • Are both protected? © 2016 Smith Moore Leatherwood LLP. ALL RIGHTS RESERVED. Example • Only the former are protected. • Veolia Water Solutions & Techs. Support v. Siemens Indus. , Inc. , No. 5: 11 -CV-00296 -FL (E. D. N. C. 2014) © 2016 Smith Moore Leatherwood LLP. ALL RIGHTS RESERVED. 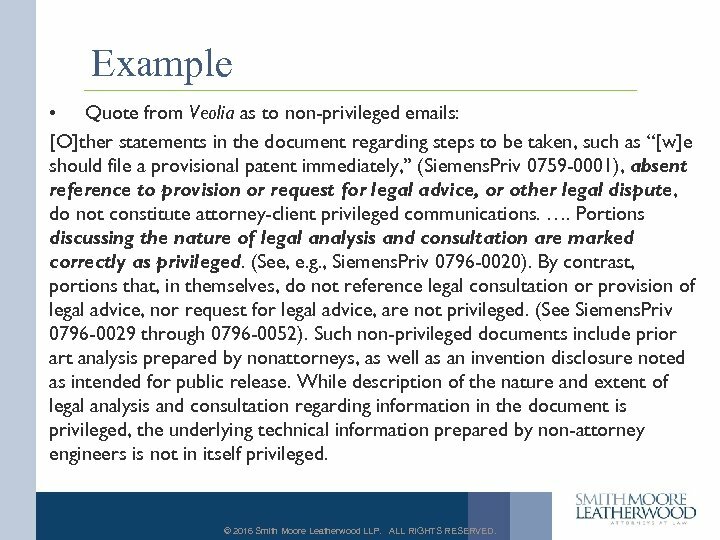 Example • Quote from Veolia as to non-privileged emails: These communications are not privileged because no attorneys or patent agents are copied, and nothing in the communications themselves specifies what legal advice or legal analysis was provided by an attorney or patent agent, nor what information if any was transmitted for purposes of legal advice. 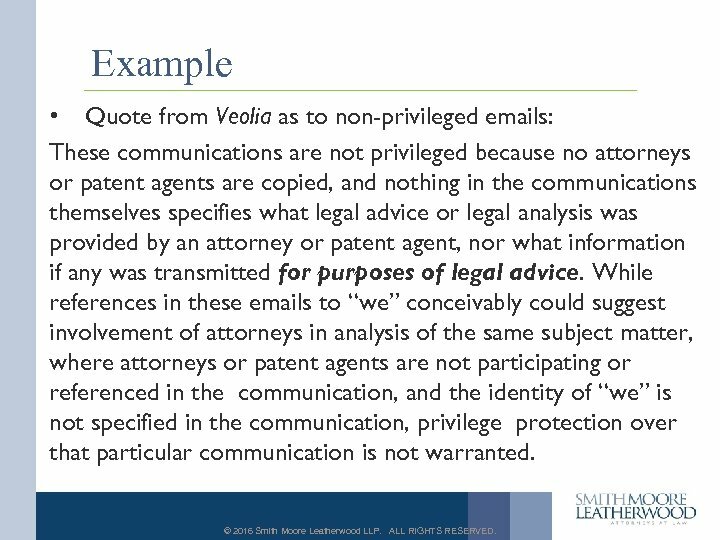 While references in these emails to “we” conceivably could suggest involvement of attorneys in analysis of the same subject matter, where attorneys or patent agents are not participating or referenced in the communication, and the identity of “we” is not specified in the communication, privilege protection over that particular communication is not warranted. © 2016 Smith Moore Leatherwood LLP. ALL RIGHTS RESERVED. Example • Quote from Veolia as to non-privileged emails: Although the nature of the discussion may implicate legal issues, such discussion by non-attorneys of issues having potential legal implications does not in itself transform the communication to attorney client privileged communication. Further, the fact that a paralegal is copied on the communication in Siemens. Priv 0286. 003, without some specific reference or direction to the paralegal, is not sufficient in itself to establish privilege, given the absence of other indicia of attorney-client privileged communication. …. © 2016 Smith Moore Leatherwood LLP. ALL RIGHTS RESERVED. Example • Quote from Veolia as to non-privileged emails: [O]ther statements in the document regarding steps to be taken, such as “[w]e should file a provisional patent immediately, ” (Siemens. Priv 0759 -0001), absent reference to provision or request for legal advice, or other legal dispute, do not constitute attorney-client privileged communications. …. Portions discussing the nature of legal analysis and consultation are marked correctly as privileged. (See, e. g. , Siemens. Priv 0796 -0020). By contrast, portions that, in themselves, do not reference legal consultation or provision of legal advice, nor request for legal advice, are not privileged. (See Siemens. Priv 0796 -0029 through 0796 -0052). Such non-privileged documents include prior art analysis prepared by nonattorneys, as well as an invention disclosure noted as intended for public release. While description of the nature and extent of legal analysis and consultation regarding information in the document is privileged, the underlying technical information prepared by non-attorney engineers is not in itself privileged. © 2016 Smith Moore Leatherwood LLP. ALL RIGHTS RESERVED. Practice Tips as to Internal Communications • More likely to be privileged if they: • Describe the nature of your legal situation. • Include “legal advice” or “legal analysis” provided or sought. • Copy counsel. • Invite response from counsel. © 2016 Smith Moore Leatherwood LLP. ALL RIGHTS RESERVED. Third-Party Communications • Can communications to third parties ever be privileged? • Sometimes. © 2016 Smith Moore Leatherwood LLP. ALL RIGHTS RESERVED. Third Parties and Confidential Intent • Your company has a data breach loss. • You hire an attorney and a damage consultant to help you through coverage issues. • Consultant issues various reports that have certain headings like “Coverage” or “Extent of Damage” or “Recovery Potential. ” • In a later lawsuit, your attorney creates a privilege log and redacts the entries under these headings. • Are the consultant’s comments under those headings protected? © 2016 Smith Moore Leatherwood LLP. ALL RIGHTS RESERVED. Protected or Produced? • • ACE US v. Union Pacific RR. , Civil Action No. 9 -2194 KHV/DJW (D. Kan. 2011) Consultant there was an independent adjuster Adjuster reports even referenced involvement of counsel. Court ordered redacted portions to be: Produced without redaction. Why? 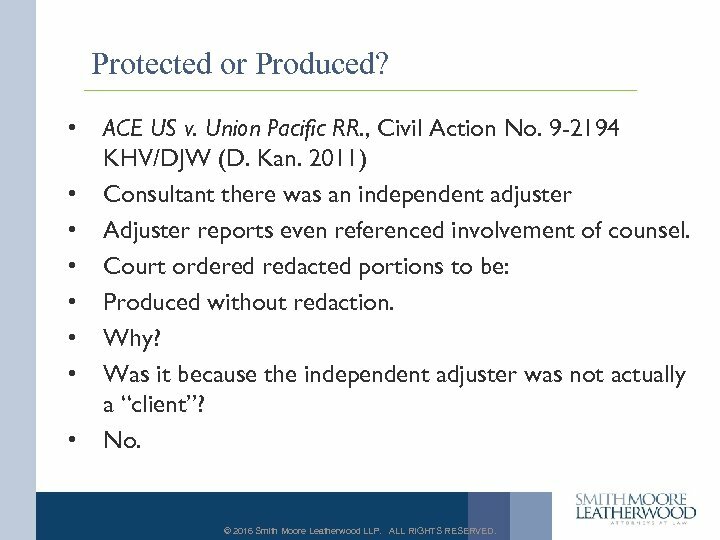 Was it because the independent adjuster was not actually a “client”? No. © 2016 Smith Moore Leatherwood LLP. ALL RIGHTS RESERVED. Third Parties and Confidential Intent • The opinion states: • “While the basis for redaction provided on the privilege log states that the redacted portion ‘[d]etail[s] legal information obtained from counsel, ’ the information was not based on information obtained from counsel. In fact, the unredacted portion of the report clearly states that ‘[w]e understand that counsel has been retained to provide further coverage comments and opinion. We differ [sic] further comments to their office. ’” © 2016 Smith Moore Leatherwood LLP. ALL RIGHTS RESERVED. Third Parties and Confidential Intent • “Thus, the author, James Ratcliff of Ratcliff Property Adjusting, acknowledges that he has not conferred with counsel. And the context of the report does not suggest that the author is seeking legal advice. Rather, the author assesses the factual scenario presented by the railcar incident and states that a legal representative or someone from Adrienne Benzoni's office should assess the legal ramifications. As legal advice is not provided or sought and the communication involves no attorney or legal advisor, this redaction was not and cannot be properly characterized as protected by the attorney-client privilege. Furthermore, to say this information was ‘obtained from counsel’ is a gross misstatement of fact. ” © 2016 Smith Moore Leatherwood LLP. ALL RIGHTS RESERVED. 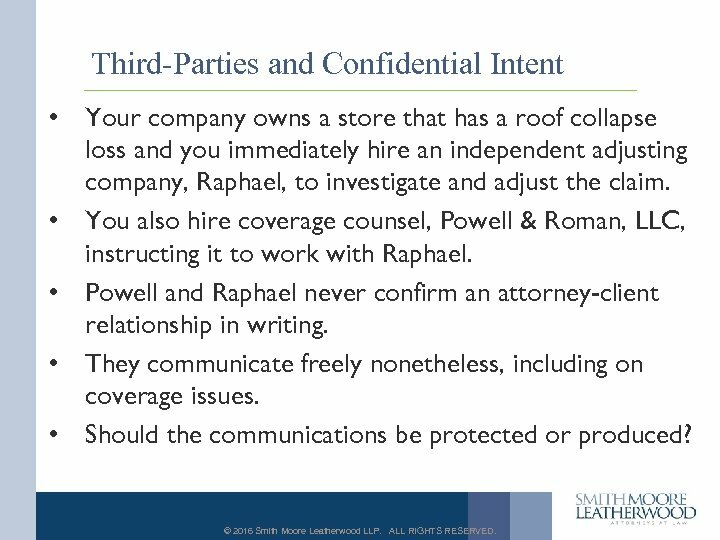 Third-Parties and Confidential Intent • Your company owns a store that has a roof collapse loss and you immediately hire an independent adjusting company, Raphael, to investigate and adjust the claim. • You also hire coverage counsel, Powell & Roman, LLC, instructing it to work with Raphael. • Powell and Raphael never confirm an attorney-client relationship in writing. • They communicate freely nonetheless, including on coverage issues. • Should the communications be protected or produced? © 2016 Smith Moore Leatherwood LLP. ALL RIGHTS RESERVED. Protected or Produced? 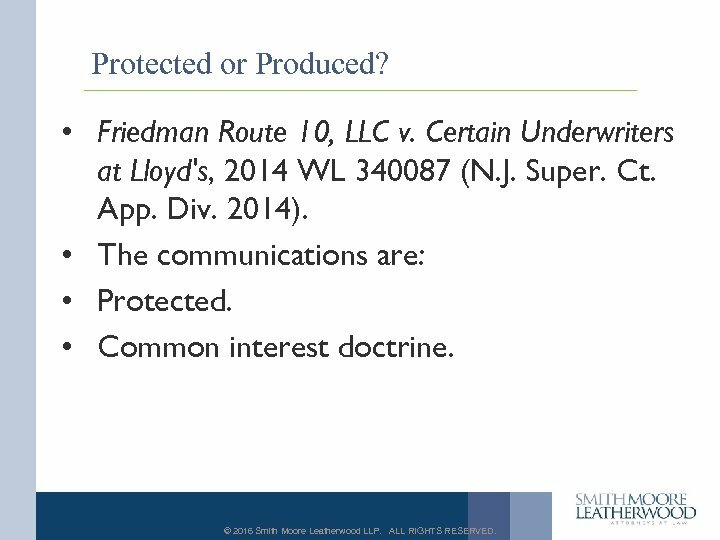 • Friedman Route 10, LLC v. Certain Underwriters at Lloyd's, 2014 WL 340087 (N. J. Super. Ct. App. Div. 2014). • The communications are: • Protected. • Common interest doctrine. © 2016 Smith Moore Leatherwood LLP. ALL RIGHTS RESERVED. Purpose and Intent Were Key · Purpose of communications: not merely for claims investigation purposes but involved “conducting legal research of the various issues surrounding plaintiff's claim, and to provide a legal opinion. ” · The court rejected the plaintiff’s argument that the privilege was waived merely because Raphael was an independent adjuster. © 2016 Smith Moore Leatherwood LLP. ALL RIGHTS RESERVED. Common Interest Doctrine • Court stated: • “Here, even though Raphael was not a party to this litigation when the subject documents were subpoenaed, it clearly shared a common interest with Lloyd's in investigating and adjusting plaintiff's claim relating to the roof damage. Accordingly, even assuming Powell was first retained by Lloyd's, the privilege was not waived by Powell's communications with Raphael, which was clearly then acting on Lloyd's behalf. ” © 2016 Smith Moore Leatherwood LLP. ALL RIGHTS RESERVED. Common Interest Doctrine • What if the purpose was not clearly “conducting legal research of the various issues surrounding plaintiff's claim, and to provide a legal opinion”? • What if the purpose was merely stated as “stay on the case as issues arise”? • What if the emails provided no legal opinions but simply relayed substance of interviews the attorney conducted of fact witnesses? © 2016 Smith Moore Leatherwood LLP. ALL RIGHTS RESERVED. 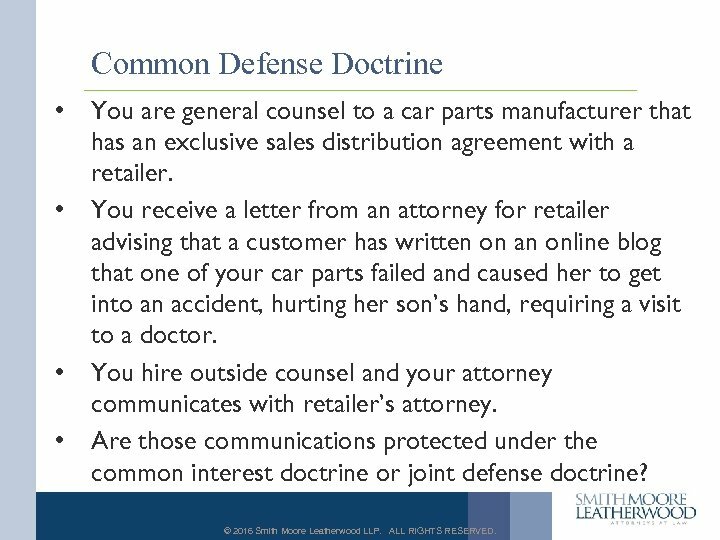 Common Defense Doctrine • • You are general counsel to a car parts manufacturer that has an exclusive sales distribution agreement with a retailer. You receive a letter from an attorney for retailer advising that a customer has written on an online blog that one of your car parts failed and caused her to get into an accident, hurting her son’s hand, requiring a visit to a doctor. You hire outside counsel and your attorney communicates with retailer’s attorney. Are those communications protected under the common interest doctrine or joint defense doctrine? © 2016 Smith Moore Leatherwood LLP. ALL RIGHTS RESERVED. Common Interest Not Enough • • Not necessarily. Need both a common interest and something more. The something more may be a “palpable threat of litigation. 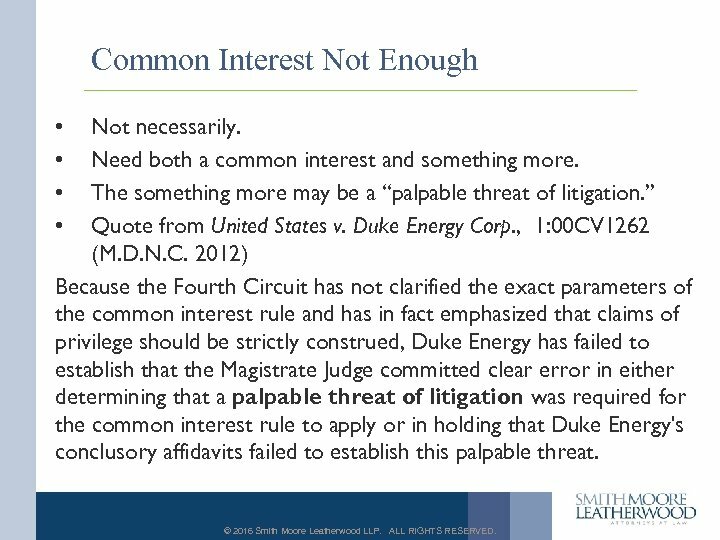 ” Quote from United States v. Duke Energy Corp. , 1: 00 CV 1262 (M. D. N. C. 2012) Because the Fourth Circuit has not clarified the exact parameters of the common interest rule and has in fact emphasized that claims of privilege should be strictly construed, Duke Energy has failed to establish that the Magistrate Judge committed clear error in either determining that a palpable threat of litigation was required for the common interest rule to apply or in holding that Duke Energy's conclusory affidavits failed to establish this palpable threat. © 2016 Smith Moore Leatherwood LLP. ALL RIGHTS RESERVED. Practice Tips on Third-Party Communications • Purpose statements: • Attorney retention letter: Investigate the facts, work with consultants, conduct legal research, analyze the legal issues, and provide a legal opinion. • Consultant retention letter: Address legal issues in conjunction with counsel. • Common defendant or co-plaintiff: Assure confidentiality of communications, as parties have common interest as to a “palpable” legal situation. © 2016 Smith Moore Leatherwood LLP. ALL RIGHTS RESERVED. Work Product Doctrine • The work product doctrine is actually an exception to a general rule. • The general rule, codified in the federal rules of civil procedure (modeled by most states), allows for broad discovery of “any nonprivileged matter that is relevant to any party's claim or defense. ” Fed. R. Civ. P. 26(b)(1). • The exception is found in Fed. R. Civ. P. Rule 26(b)(3)(A)-(B) © 2016 Smith Moore Leatherwood LLP. ALL RIGHTS RESERVED. Work Product Doctrine • Fed. R. Civ. P. Rule 26(b)(3)(A)-(B), provides: – Documents and Tangible Things. Ordinarily, a party may not discover documents and tangible things that are prepared in anticipation of litigation or for trial by or for another party or its representative (including the other party's attorney, consultant, surety, indemnitor, insurer, or agent). 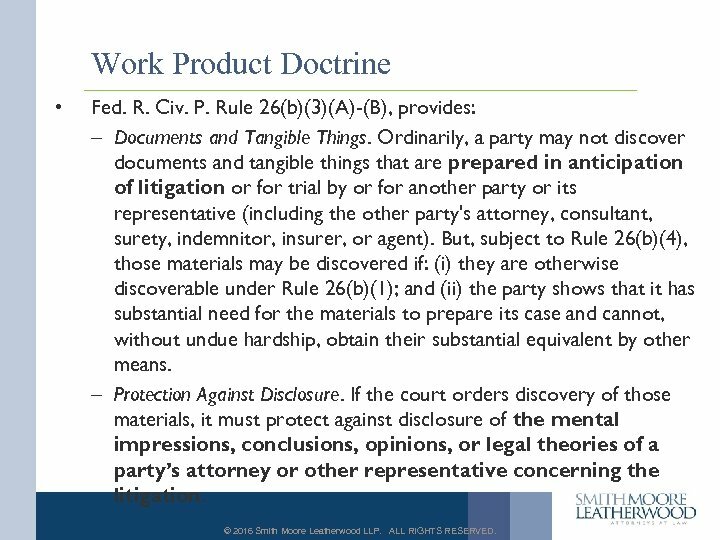 But, subject to Rule 26(b)(4), those materials may be discovered if: (i) they are otherwise discoverable under Rule 26(b)(1); and (ii) the party shows that it has substantial need for the materials to prepare its case and cannot, without undue hardship, obtain their substantial equivalent by other means. – Protection Against Disclosure. If the court orders discovery of those materials, it must protect against disclosure of the mental impressions, conclusions, opinions, or legal theories of a party’s attorney or other representative concerning the litigation. © 2016 Smith Moore Leatherwood LLP. ALL RIGHTS RESERVED. Work Product Doctrine in NC: Boiled Down • Hammond v. Saini, 748 S. E. 2 d 585 (NC App. 2013) • Protects documents prepared in anticipation of litigation by a party or the party’s attorney, consultant, surety, indemnitor, insurer, or agent. • Most protected are the mental impressions, conclusions, opinions, or legal theories of a party’s attorney or other representative concerning the litigation. • The key is “anticipation of litigation. ” © 2016 Smith Moore Leatherwood LLP. ALL RIGHTS RESERVED. 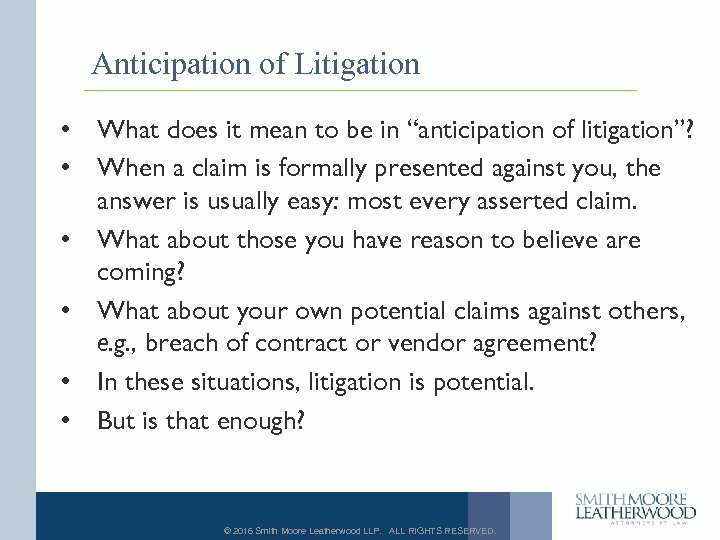 Anticipation of Litigation • What does it mean to be in “anticipation of litigation”? • When a claim is formally presented against you, the answer is usually easy: most every asserted claim. • What about those you have reason to believe are coming? • What about your own potential claims against others, e. g. , breach of contract or vendor agreement? • In these situations, litigation is potential. • But is that enough? © 2016 Smith Moore Leatherwood LLP. ALL RIGHTS RESERVED. 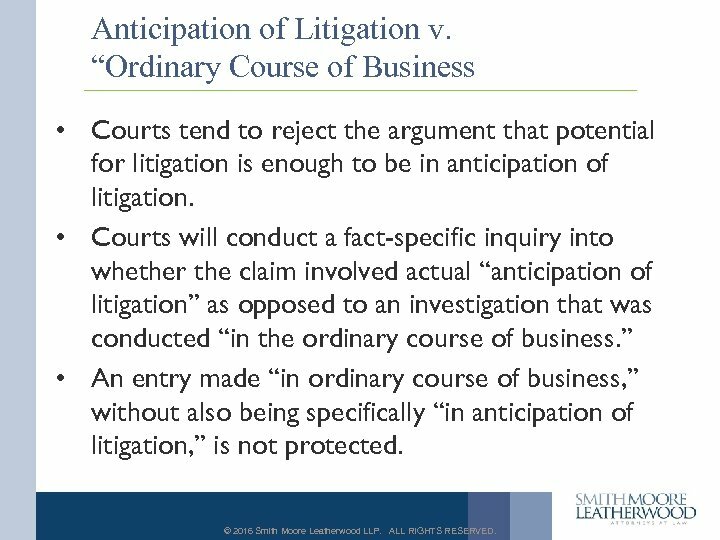 Anticipation of Litigation v. “Ordinary Course of Business • Courts tend to reject the argument that potential for litigation is enough to be in anticipation of litigation. • Courts will conduct a fact-specific inquiry into whether the claim involved actual “anticipation of litigation” as opposed to an investigation that was conducted “in the ordinary course of business. ” • An entry made “in ordinary course of business, ” without also being specifically “in anticipation of litigation, ” is not protected. © 2016 Smith Moore Leatherwood LLP. ALL RIGHTS RESERVED. 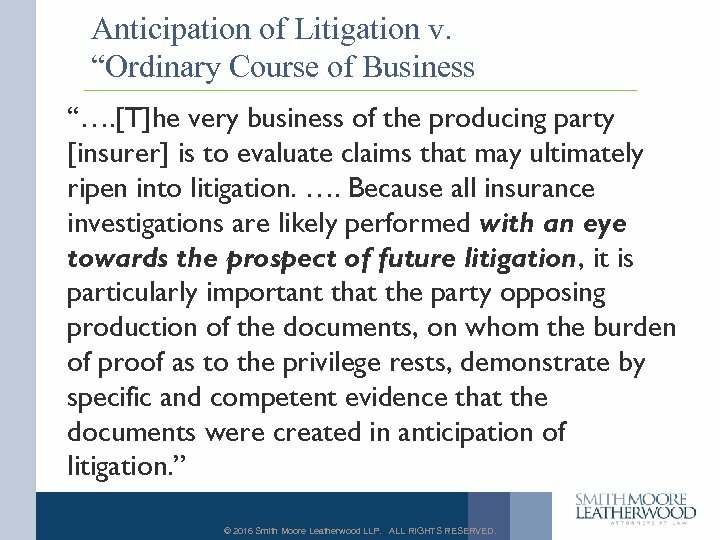 Anticipation of Litigation v. “Ordinary Course of Business • The dilemma between what is “in anticipation of litigation” and what is “in the ordinary course of business” in the subrogation world was discussed in QBE Ins. Corp. v. Interstate Fire & Safety Equp. Co. , Case No. 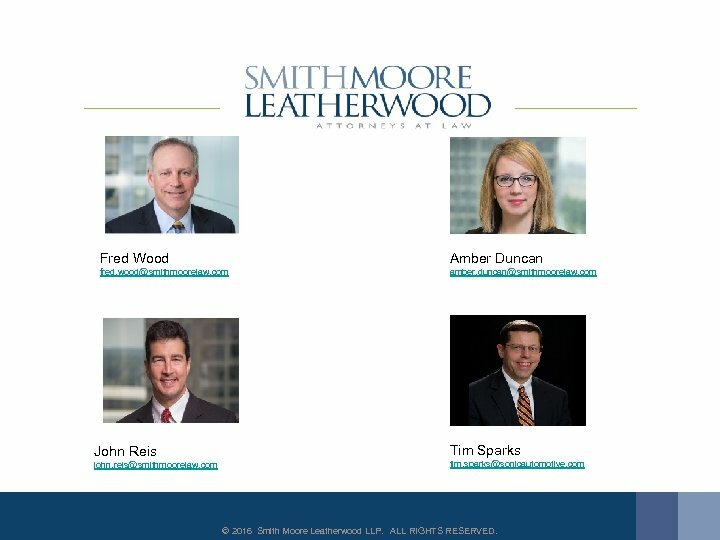 , WL 692982 (D. Conn. 2011) as follows: © 2016 Smith Moore Leatherwood LLP. ALL RIGHTS RESERVED. Anticipation of Litigation v. “Ordinary Course of Business “Whether the first-party adjustor claim notes are protected hinges on whether they were created because of anticipated litigation or in the ordinary course of QBE's business. …. [R]esolving that question with respect to an insurance company's claim notes can prove challenging. A first-party insurer is apt to investigate any claim in the shadow of future litigation, either as a potential defendant if it denies the insured's claim or as a potential plaintiff if it exercises subrogation rights against a third party. ” © 2016 Smith Moore Leatherwood LLP. ALL RIGHTS RESERVED. Anticipation of Litigation v. “Ordinary Course of Business “…. [T]he very business of the producing party [insurer] is to evaluate claims that may ultimately ripen into litigation. …. Because all insurance investigations are likely performed with an eye towards the prospect of future litigation, it is particularly important that the party opposing production of the documents, on whom the burden of proof as to the privilege rests, demonstrate by specific and competent evidence that the documents were created in anticipation of litigation. ” © 2016 Smith Moore Leatherwood LLP. ALL RIGHTS RESERVED. Anticipation of Litigation v. “Ordinary Course of Business • This dilemma is not unique to insurance companies. • Any company that is presented with claims or potential claims is likely to be held to a similar standard. • This is especially true where the company has standard operating procedures for handling such potential claims. © 2016 Smith Moore Leatherwood LLP. ALL RIGHTS RESERVED. 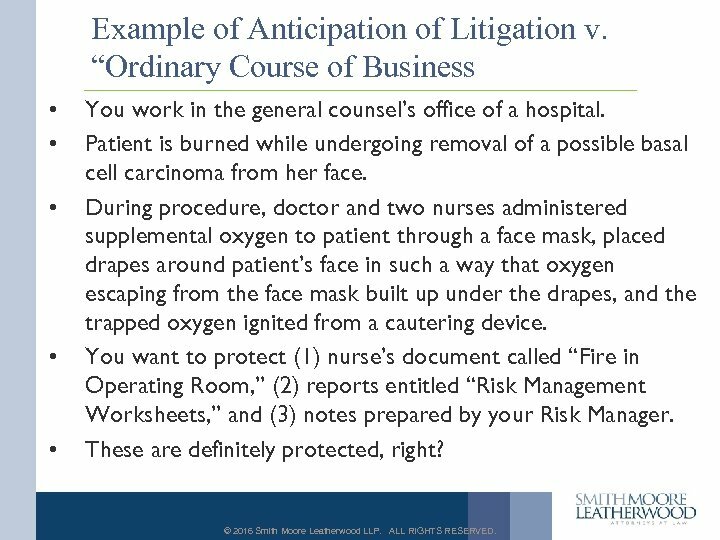 Example of Anticipation of Litigation v. “Ordinary Course of Business • • • You work in the general counsel’s office of a hospital. Patient is burned while undergoing removal of a possible basal cell carcinoma from her face. During procedure, doctor and two nurses administered supplemental oxygen to patient through a face mask, placed drapes around patient’s face in such a way that oxygen escaping from the face mask built up under the drapes, and the trapped oxygen ignited from a cautering device. You want to protect (1) nurse’s document called “Fire in Operating Room, ” (2) reports entitled “Risk Management Worksheets, ” and (3) notes prepared by your Risk Manager. These are definitely protected, right? © 2016 Smith Moore Leatherwood LLP. ALL RIGHTS RESERVED. Anticipation of Litigation v. “Ordinary Course of Business • • • Wrong. Hammond v. Saini, 748 S. E. 2 d 585 (NC App. 2013) First two documents were prepared in ordinary course of business, because they followed the hospital’s policies regarding "Quality Care Reports, " "Reportable Incidents, " and the "Patient Safety Response Team. " As to the “Risk Management Worksheets, ” the court remanded to the trial court to determine if these were also made pursuant to the same policies, as the record was unclear. If they were made pursuant to those policies, they are not protected. © 2016 Smith Moore Leatherwood LLP. ALL RIGHTS RESERVED. Anticipation of Litigation v. “Ordinary Course of Business • Quote from Risk Manager’s Affidavit in Hammond: “Because of the nature of the event (a fire in the operating room) and based on my experience as a Risk Manager, I immediately anticipated that litigation related to the event could result. In anticipation of litigation, I met with members of the plaintiff's family along with Jim Bax, CRNA, Dr. Saini, Dr. Kubit and Dr. Ruben Rivers to discuss the incident. I do not recall the date of that meeting. On September 20, 2010, in anticipation of litigation, I met with operating room personnel to discuss the event. This meeting occurred after my meeting with Ms. Hammond's family. After both of these meetings, and in anticipation of litigation, I prepared notes reflecting the discussions that occurred in the meetings. ” © 2016 Smith Moore Leatherwood LLP. ALL RIGHTS RESERVED. 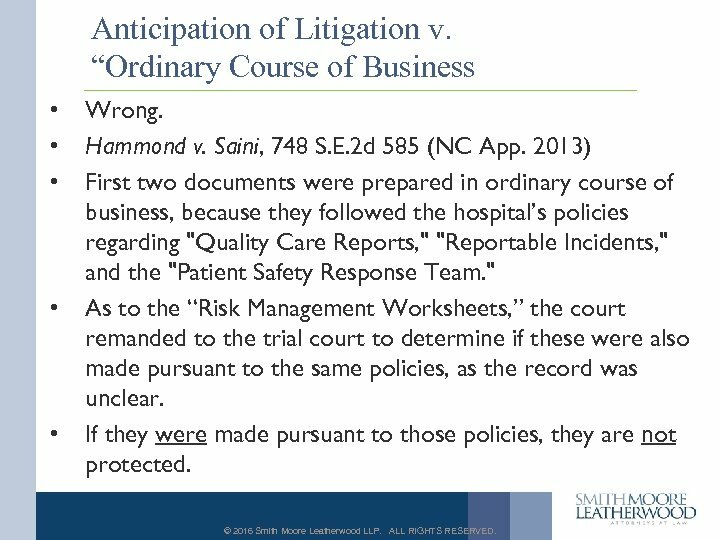 Anticipation of Litigation v. “Ordinary Course of Business • Quote about Risk Manager’s Affidavit in Hammond: “Plaintiff counters, however, by arguing that the record is unclear whether Maynard actually prepared his notes in the ordinary course of business pursuant to CCHS's policies regarding “Quality Care Reports, " "Reportable Incidents, " and the "Patient Safety Response Team. " 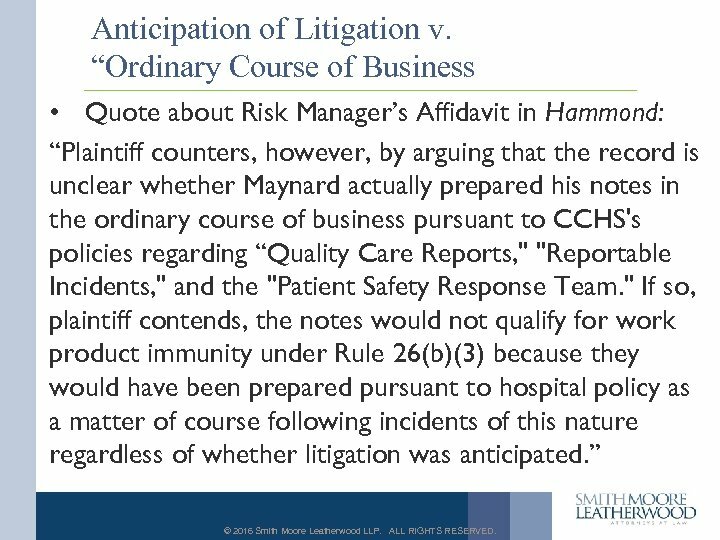 If so, plaintiff contends, the notes would not qualify for work product immunity under Rule 26(b)(3) because they would have been prepared pursuant to hospital policy as a matter of course following incidents of this nature regardless of whether litigation was anticipated. ” © 2016 Smith Moore Leatherwood LLP. ALL RIGHTS RESERVED. Anticipation of Litigation v. “Ordinary Course of Business • Quote about interrogatories in Hammond: “Finally, we reject defendants’ argument that the trial court abused its discretion in compelling them to respond to Plaintiff’s interrogatories despite their objections based on the work product doctrine. It is well established that the work product doctrine only applies to documents or other tangible things. See Long, 155 N. C. App. at 136 -37, 574 S. E. 2 d at 176 (holding that ‘plaintiff's interrogatories did not violate Rule 26(b)(3)’ because they ‘did not ask defendants for documents or tangible things’). ” © 2016 Smith Moore Leatherwood LLP. ALL RIGHTS RESERVED. 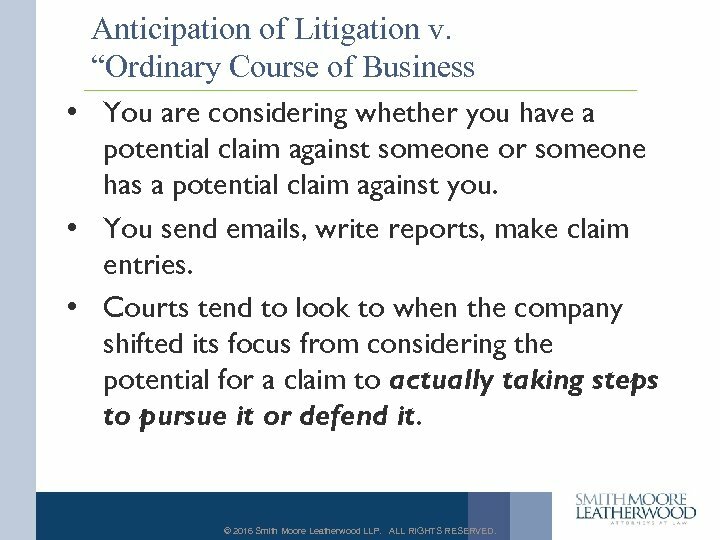 Anticipation of Litigation v. “Ordinary Course of Business • You are considering whether you have a potential claim against someone or someone has a potential claim against you. • You send emails, write reports, make claim entries. • Courts tend to look to when the company shifted its focus from considering the potential for a claim to actually taking steps to pursue it or defend it. © 2016 Smith Moore Leatherwood LLP. ALL RIGHTS RESERVED. How About This Quote, Folks! “In order to decide whether a document is discoverable, courts look to see … whethere is a sufficiently concrete connection between the document and possible litigation; whether the document was generated in anticipation of probable litigation; whether the document was created when litigation was fairly foreseeable; whether the document was prepared before counsel was retained; and whether the document was created when the probability of litigation was substantial and imminent. Documents created by an insurance company when it is deciding whether to pay, whether to pay and to seek subrogation, or whether to pay and to take no further action, are not prepared in anticipation of litigation. A. Wilson, Inc. v. General Services Administration (June 15, 1994) found at http: //www. gsbca 2. gsa. gov/oldappeals/w 12596 b. txt, citing Schmidt v. California State Automobile Assn, 127 F. R. D. 182 (D. Nev. 1989); Pasteris v. Robillard, 121 F. R. D. 18 (D. Mass. 1988); Sham v. Hyannis Heritage House Hotel, Inc. , 118 F. R. D. 24 (D. Mass. 1987); Fann v. Giant Food, Inc. , 115 F. R. D. 593 (D. D. C. 1987); State Farm Fire & Casualty Co. v. Perrigan, 102 F. R. D. 235 (W. D. Va. 1984); Carver v. Allstate Insurance Co. , 94 F. R. D. 131 (S. D. Ga. 1981). © 2016 Smith Moore Leatherwood LLP. ALL RIGHTS RESERVED. The Degree of the Threat • NC state court: Must show “the material was prepared under circumstances in which a reasonable person might anticipate a possibility of litigation. ” Veitia v. Mulshine Builders LLC 2012 WL 4878877 (N. C. App. , 2012) (expert report compelled) • Federal court: “[T]he document must be prepared under the 'substantial and imminent' or 'fairly foreseeable' threat of litigation. ” U. S. v. Bertie Ambulance Serv. , Inc, No. 2: 14 -CV 00053 -F (E. D. N. C. 2015) (witness interviews compelled) • Foreseeable threat (state) vs. Imminent threat (fed) • Different standards but similar results: production often compelled. © 2016 Smith Moore Leatherwood LLP. ALL RIGHTS RESERVED. 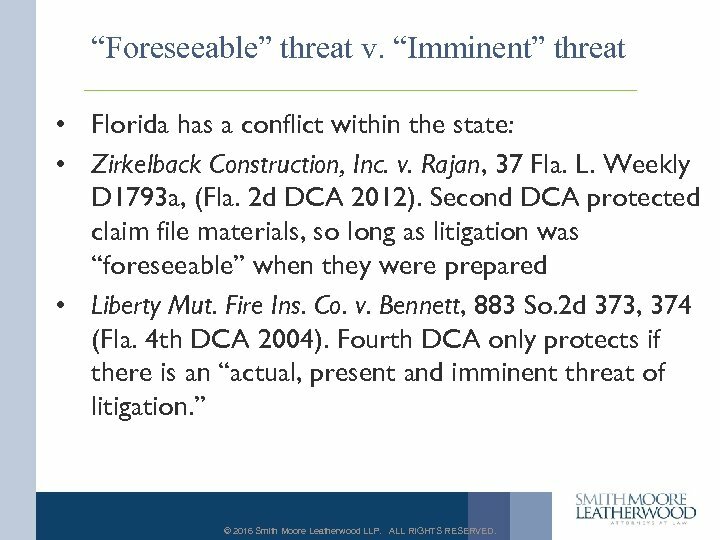 “Foreseeable” threat v. “Imminent” threat • Florida has a conflict within the state: • Zirkelback Construction, Inc. v. Rajan, 37 Fla. L. Weekly D 1793 a, (Fla. 2 d DCA 2012). Second DCA protected claim file materials, so long as litigation was “foreseeable” when they were prepared • Liberty Mut. Fire Ins. Co. v. Bennett, 883 So. 2 d 373, 374 (Fla. 4 th DCA 2004). Fourth DCA only protects if there is an “actual, present and imminent threat of litigation. ” © 2016 Smith Moore Leatherwood LLP. ALL RIGHTS RESERVED. Fact Work Product v. Opinion Work Product • U. S. v. Bertie Ambulance Serv. , Inc, (E. D. N. C. 2015): “Fact work-product is defined as ‘those documents prepared by the attorney which do not contain the mental impressions, conclusions[, ] or opinions of the attorney. ’ …. Opinion work-product is defined as ‘work product that contains those fruits of the attorney's mental processes. . ’” © 2016 Smith Moore Leatherwood LLP. ALL RIGHTS RESERVED. 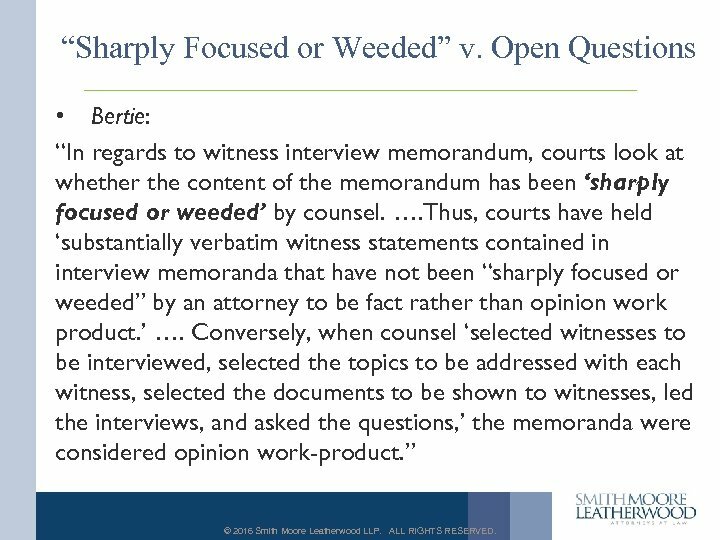 “Sharply Focused or Weeded” v. Open Questions • Bertie: “In regards to witness interview memorandum, courts look at whether the content of the memorandum has been ‘sharply focused or weeded’ by counsel. …. Thus, courts have held ‘substantially verbatim witness statements contained in interview memoranda that have not been “sharply focused or weeded” by an attorney to be fact rather than opinion work product. ’ …. Conversely, when counsel ‘selected witnesses to be interviewed, selected the topics to be addressed with each witness, selected the documents to be shown to witnesses, led the interviews, and asked the questions, ’ the memoranda were considered opinion work-product. ” © 2016 Smith Moore Leatherwood LLP. ALL RIGHTS RESERVED. Practice Tips as to Work Product Documents • • Pre-suit Be wary of a “soft” or potential threat. If you anticipate litigation, put it in your entries. What is “extraordinary” about this situation? Refer to or copy counsel, not just management. If copying third parties, is there common interest plus? Your counsel should be “sharply focused or weeded. ” © 2016 Smith Moore Leatherwood LLP. ALL RIGHTS RESERVED. Practice Tips as to Work Product Documents • • • Post suit Privilege log. Redaction. Beware the “General Objection. ” Consent Order on Protected Information. © 2016 Smith Moore Leatherwood LLP. ALL RIGHTS RESERVED. Work Product: Risk or Loss Control Docs • Are risk or loss control documents protected? • One court has stated, “Many courts have already addressed the issue of the discoverability of underwriting files, and the general consensus is that they are discoverable. ” Clean Earth of Md. , Inc. v. Total Safety, Inc. , 2011 WL 4832381 (N. D. W. Va. 2011) (compiling cases). • Here are some choice quotes from cases requiring production: © 2016 Smith Moore Leatherwood LLP. ALL RIGHTS RESERVED. 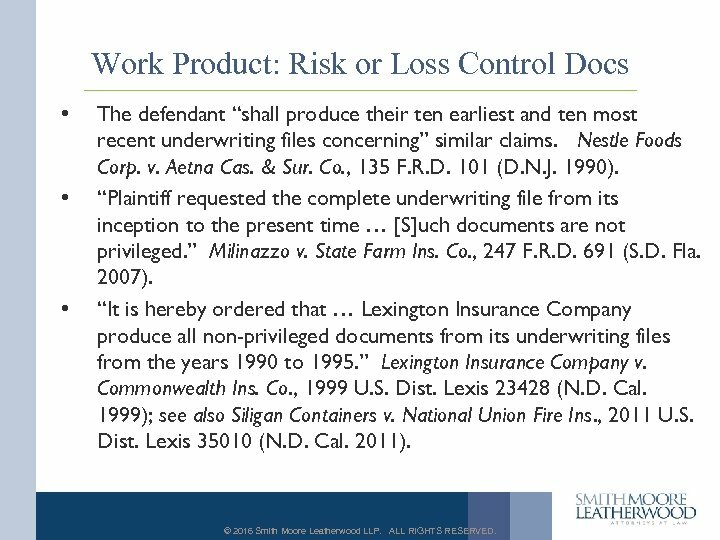 Work Product: Risk or Loss Control Docs • • • The defendant “shall produce their ten earliest and ten most recent underwriting files concerning” similar claims. Nestle Foods Corp. v. Aetna Cas. & Sur. Co. , 135 F. R. D. 101 (D. N. J. 1990). “Plaintiff requested the complete underwriting file from its inception to the present time … [S]uch documents are not privileged. ” Milinazzo v. State Farm Ins. Co. , 247 F. R. D. 691 (S. D. Fla. 2007). “It is hereby ordered that … Lexington Insurance Company produce all non-privileged documents from its underwriting files from the years 1990 to 1995. ” Lexington Insurance Company v. Commonwealth Ins. Co. , 1999 U. S. Dist. Lexis 23428 (N. D. Cal. 1999); see also Siligan Containers v. National Union Fire Ins. , 2011 U. S. Dist. Lexis 35010 (N. D. Cal. 2011). © 2016 Smith Moore Leatherwood LLP. ALL RIGHTS RESERVED. Work Product: Risk or Loss Control Docs • • • “The admissibility of the [underwriting file] is for later determination, but based on the broad standard of relevance in discovery matters, [the] motion to compel … is granted. ” Hoechst Celanese Corp. v. National Union Fire Insurance Company, 623 A. 2 d 1099 (Del. Super. 1991). Insurer “abused the assertion of privilege over matters to which no privilege applied[, ] including listing information in the underwriting file as privileged …. ” ACE American Insurance Company v. Underwriters at Lloyds & Co. , 2004 WL 5257933 (Pa. Ct. Cm. Pls. 2004). Finding the information in the underwriting file was relevant and discoverable since a possibility existed “that the information sought may be relevant to the subject matter of the action. ” Westheme Co. , Ltd v. NH Ins. Co. , 82 F. R. D. 702 (S. D. N. Y. 1979). © 2016 Smith Moore Leatherwood LLP. ALL RIGHTS RESERVED. Practice Tips as to Risk Loss Docs • • • Duty to search. Log of claims. If “oppressive” or “burdensome, ” how so? New federal rules may help. Stipulated confidentiality order. © 2016 Smith Moore Leatherwood LLP. ALL RIGHTS RESERVED. 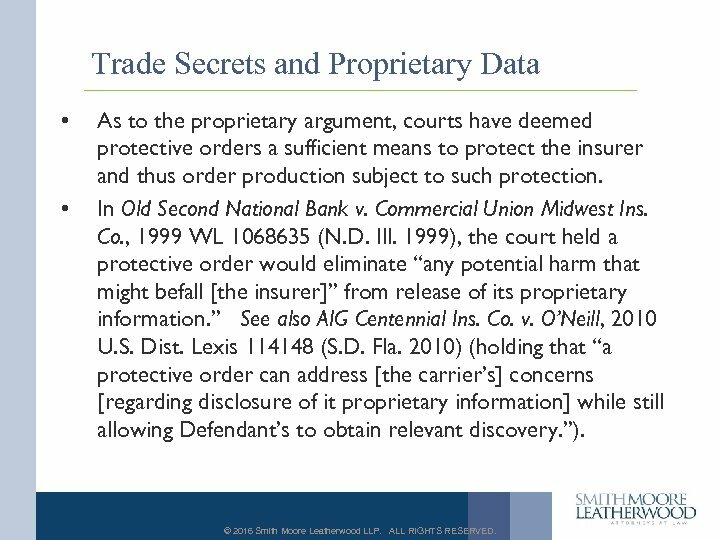 Trade Secrets and Proprietary Data • • As to the proprietary argument, courts have deemed protective orders a sufficient means to protect the insurer and thus order production subject to such protection. In Old Second National Bank v. Commercial Union Midwest Ins. Co. , 1999 WL 1068635 (N. D. Ill. 1999), the court held a protective order would eliminate “any potential harm that might befall [the insurer]” from release of its proprietary information. ” See also AIG Centennial Ins. Co. v. O’Neill, 2010 U. S. Dist. Lexis 114148 (S. D. Fla. 2010) (holding that “a protective order can address [the carrier’s] concerns [regarding disclosure of it proprietary information] while still allowing Defendant’s to obtain relevant discovery. ”). © 2016 Smith Moore Leatherwood LLP. ALL RIGHTS RESERVED. Employer Confidentiality Agreements • Employers typically impose internal confidentiality restrictions to: – protect confidential information, including when conducting internal investigations; and – prevent disparagement by current and former employees. © 2016 Smith Moore Leatherwood LLP. ALL RIGHTS RESERVED. Employer Confidentiality Agreements • An investigation is usually launched if an employee alleges potentially illegal or unethical conduct by the company or its employees. • Best practices dictate that the witness not discuss information about the investigation in order to: – Maintain investigation integrity; – Maintain attorney client privilege; and – Keep facts of investigation out of the public eye before the company can determine whether a violation has in fact occurred, and if so, how the company will respond. © 2016 Smith Moore Leatherwood LLP. ALL RIGHTS RESERVED. Employer Confidentiality Agreements • • • However, several federal agencies have interpreted whistleblower protections broadly in a manner that impacts various employer agreements that contain confidentiality provisions. In 2010, the Dodd-Frank Act amended the Exchange Act by adding certain Whistleblower Incentives and Protections – the SEC has aggressively enforced these provisions. NOTE: Although most of the Dodd-Frank Act only captures public companies, the whistleblower provisions can capture private companies too as there a number of ways in which a private company can violate the federal securities laws. © 2016 Smith Moore Leatherwood LLP. ALL RIGHTS RESERVED. 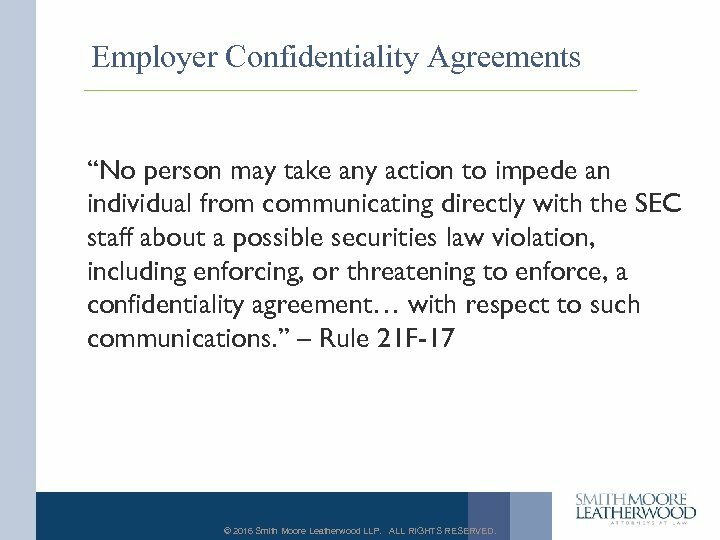 Employer Confidentiality Agreements “No person may take any action to impede an individual from communicating directly with the SEC staff about a possible securities law violation, including enforcing, or threatening to enforce, a confidentiality agreement… with respect to such communications. ” – Rule 21 F-17 © 2016 Smith Moore Leatherwood LLP. ALL RIGHTS RESERVED. 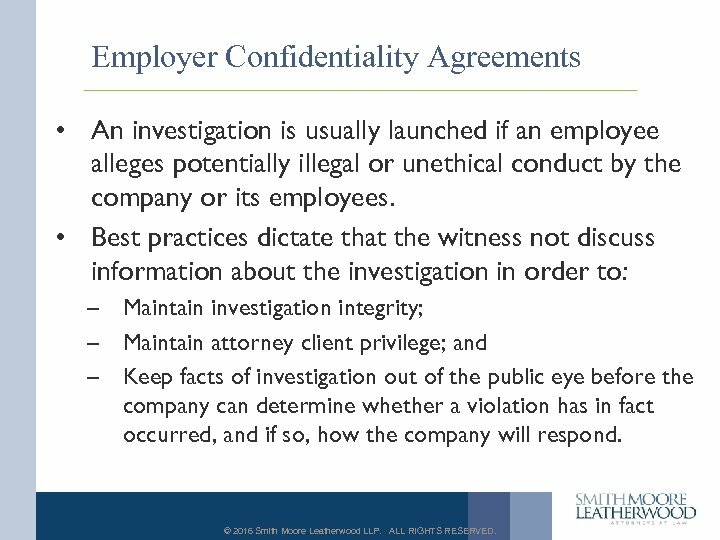 Employer Confidentiality Agreements • On February 25, 2015, the WSJ reported that the SEC Enforcement Division had sent inquiries to a large number of companies requesting copies of “every nondisclosure agreement, confidentiality agreement, severance agreement and settlement agreement they entered into with employees since Dodd-Frank went into effect, as well as documents related to corporate training on confidentiality. ” • SEC letter reviewed by the WSJ also asked for “all documents that refer or relate to whistleblowing” and a list of terminated employees. © 2016 Smith Moore Leatherwood LLP. ALL RIGHTS RESERVED. Employer Confidentiality Agreements • • In April 2015, the SEC announced its first Whistleblower Protection Case involving a employer confidentiality agreement. The SEC fined a company for improperly using restrictive language in confidentiality agreements with employees that had the potential to hamper the whistleblower process – – – Company policy required witnesses in certain internal investigations to sign confidentiality agreements This was a form agreement that included language that witness could be disciplined/fined for discussing matters with outside parties without approval by legal department In the Cease & Desist Order, SEC states there is no evidence: (1) that this language actually hampered any whistleblower reports, or (2) the company ever took action to enforce the form confidentiality agreement © 2016 Smith Moore Leatherwood LLP. ALL RIGHTS RESERVED. Employer Confidentiality Agreements “SEC rules prohibit employers from taking measures through confidentiality, employment, severance, or other type of agreements that may silence potential whistleblowers before they can reach out to the SEC. We will vigorously enforce this provision. ” - Andrew Ceresney, Director of the SEC’s Division of Enforcement © 2016 Smith Moore Leatherwood LLP. ALL RIGHTS RESERVED. 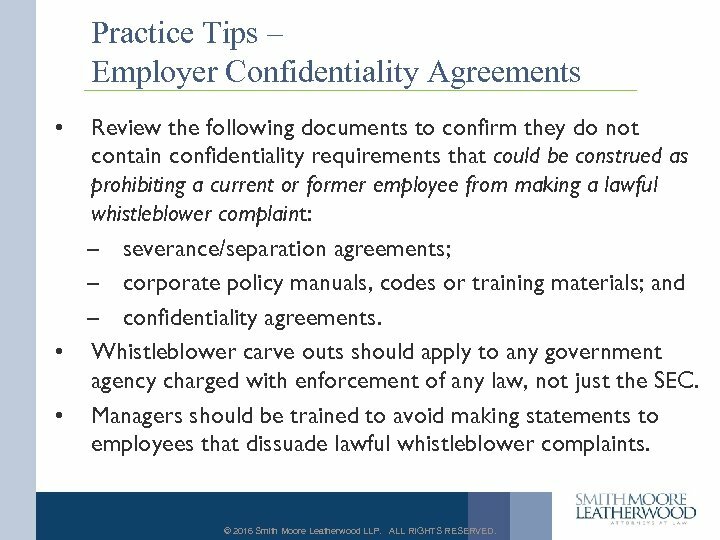 Practice Tips – Employer Confidentiality Agreements • Review the following documents to confirm they do not contain confidentiality requirements that could be construed as prohibiting a current or former employee from making a lawful whistleblower complaint: – severance/separation agreements; – corporate policy manuals, codes or training materials; and – confidentiality agreements. • Whistleblower carve outs should apply to any government agency charged with enforcement of any law, not just the SEC. • Managers should be trained to avoid making statements to employees that dissuade lawful whistleblower complaints. © 2016 Smith Moore Leatherwood LLP. ALL RIGHTS RESERVED. Confidential Settlement Agreements • How airtight is a confidentiality provision in a settlement agreement? © 2016 Smith Moore Leatherwood LLP. ALL RIGHTS RESERVED. Confidential Settlement Agreements • Three basic approaches to discoverability of confidential settlements. • Balancing approach (the prevailing approach) • Two opposing bright-line approaches: – the “not discoverable approach” even if relevant – the “discoverable” approach if relevant. • Unclear where NC stands. © 2016 Smith Moore Leatherwood LLP. ALL RIGHTS RESERVED. 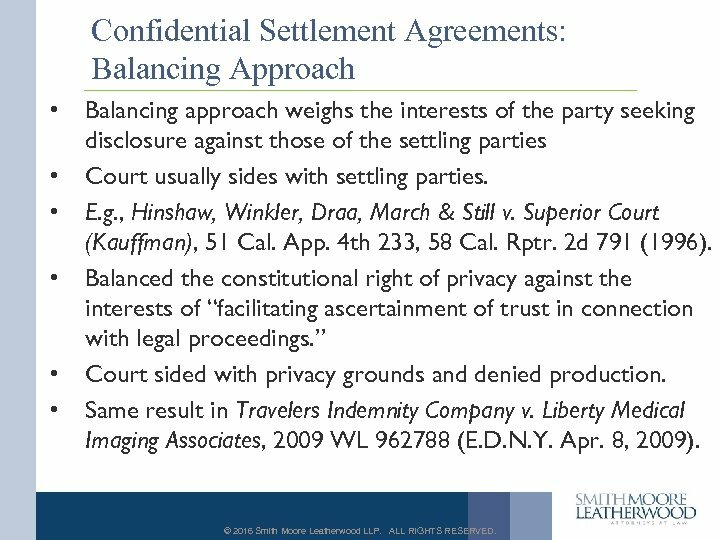 Confidential Settlement Agreements: Balancing Approach • • • Balancing approach weighs the interests of the party seeking disclosure against those of the settling parties Court usually sides with settling parties. E. g. , Hinshaw, Winkler, Draa, March & Still v. Superior Court (Kauffman), 51 Cal. App. 4 th 233, 58 Cal. Rptr. 2 d 791 (1996). Balanced the constitutional right of privacy against the interests of “facilitating ascertainment of trust in connection with legal proceedings. ” Court sided with privacy grounds and denied production. Same result in Travelers Indemnity Company v. Liberty Medical Imaging Associates, 2009 WL 962788 (E. D. N. Y. Apr. 8, 2009). © 2016 Smith Moore Leatherwood LLP. ALL RIGHTS RESERVED. Confidential Settlement Agreements: Balancing Approach • The balancing approach will sometimes allow for discovery of the agreement, but usually only as to amount of the settlement. • New York v. Solvent Chemical Co. , 214 F. R. D. 106 (W. D. N. Y. 2003). • But see Wal-Mart Stores, Inc. v. Strachan, 82 So. 3 d 1052 (Fla. 4 th. DCA 2011) (abolition of joint and several liability and of set-off makes amount irrelevant) © 2016 Smith Moore Leatherwood LLP. ALL RIGHTS RESERVED. Confidential Settlement Agreements: The “Not Discoverable” Approach • • • UMC/Stanford, Inc. v. Allianz Underwriters Ins. Co. , 267 N. J. Super 52, 6771, 647 A. 2 d 182, 190 -192 (1994) Policyholder enters into confidential settlement with certain insurers. Non-settling insurer seeks terms of settlement agreement, to determine if insurers had paid entirety of policyholder’s claimed loss. On public policy grounds, court upheld terms of confidentiality provisions and blocked disclosure of the settlement agreement. Two main public policy grounds: social good and privacy interests: – (a) settlements are socially desirable and confidentiality fosters settlements, and – (b) the confidentiality provision was bargained-for and such private dealings should be respected. © 2016 Smith Moore Leatherwood LLP. ALL RIGHTS RESERVED. Confidential Settlement Agreements: The “Discoverable” Approach • • • Continental Insurance Company, 994 S. W. 2 d 423 (Tex. App. 1999). Disclosure mandated Coverage dispute: policyholder settled with certain of its insurers. Non-settling insurer (excess insurer) sought full disclosure of all terms Wanted to know if policyholder had been made whole. 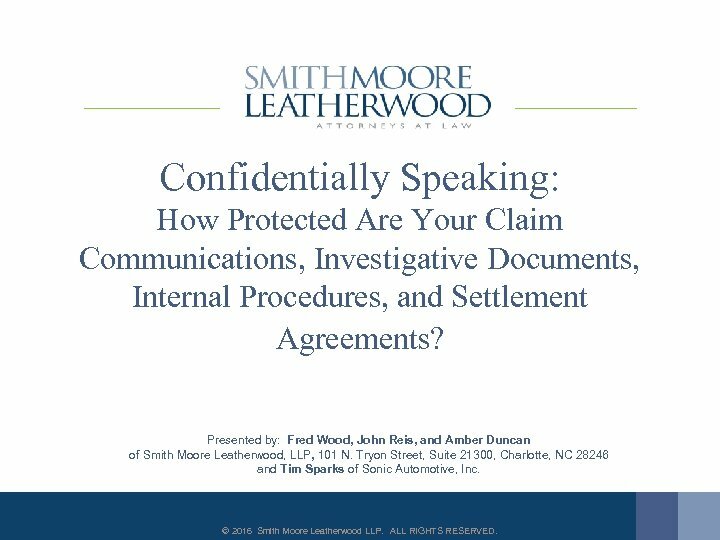 Court ordered disclosure of confidential settlement agreement with broad sweeping statement on confidentiality provisions: © 2016 Smith Moore Leatherwood LLP. ALL RIGHTS RESERVED. 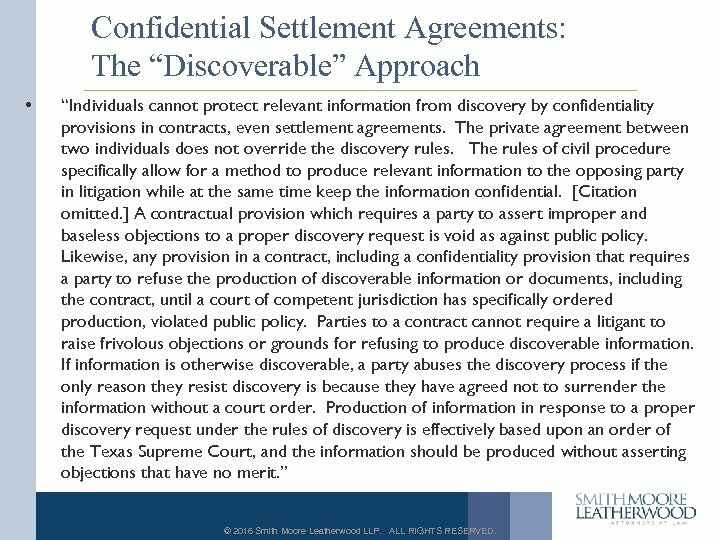 Confidential Settlement Agreements: The “Discoverable” Approach • “Individuals cannot protect relevant information from discovery by confidentiality provisions in contracts, even settlement agreements. The private agreement between two individuals does not override the discovery rules. The rules of civil procedure specifically allow for a method to produce relevant information to the opposing party in litigation while at the same time keep the information confidential. [Citation omitted. ] A contractual provision which requires a party to assert improper and baseless objections to a proper discovery request is void as against public policy. Likewise, any provision in a contract, including a confidentiality provision that requires a party to refuse the production of discoverable information or documents, including the contract, until a court of competent jurisdiction has specifically ordered production, violated public policy. Parties to a contract cannot require a litigant to raise frivolous objections or grounds for refusing to produce discoverable information. If information is otherwise discoverable, a party abuses the discovery process if the only reason they resist discovery is because they have agreed not to surrender the information without a court order. Production of information in response to a proper discovery request under the rules of discovery is effectively based upon an order of the Texas Supreme Court, and the information should be produced without asserting objections that have no merit. ” © 2016 Smith Moore Leatherwood LLP. ALL RIGHTS RESERVED. Practical Tips (when you want to get theirs) • Demonstrate why it is relevant to an issue in your case. • Settlement amount is easiest to get, unless state has no set-off. • If you want more than amount, demonstrate why else you want it: – – – Could recitations of fact be important? Indemnity or hold harmless provision? Definition of “Releasees”: might it list you or your client? Non-cooperation provisions as to non-settling parties? Non-sharing of experts provision? Destruction of documents? • Request for an in camera inspection by the court may at least give the seeking party a shot. © 2016 Smith Moore Leatherwood LLP. ALL RIGHTS RESERVED. Practical Tips (when you want it kept secret) • The amount is the most likely term to be disclosed. • Simpler can be better – Imagine a judge reading your elaborate recitations of fact or clauses on indemnity, hold harmless, listing of releasees, non-cooperation, non-sharing of experts, destruction of documents. • Early in case, consider a Stipulated Order on Confidentiality with a clause on settlement disclosures: – Binding on parties – Court’s adoption similarly powerful – Sample Stipulation available on request © 2016 Smith Moore Leatherwood LLP. ALL RIGHTS RESERVED. One Example of Such Provision • 17. Settlement Provisions. If some or all of the parties to this lawsuit should enter into a settlement agreement that contains a confidentiality clause or provision, all parties agree that the settlement agreement and the terms of the settlement agreement shall not be disclosed to persons or entities not signatories to that settlement agreement, with the exception that any party to this lawsuit that is not a party to the settlement agreement shall be entitled to know the amount of the settlement but shall not disclose that amount to any person or entity not a party to this lawsuit. © 2016 Smith Moore Leatherwood LLP. ALL RIGHTS RESERVED. Another Example of Such Provision • 17. Settlement Provisions. If some or all of the parties to this lawsuit should enter into a settlement agreement that contains a confidentiality clause or provision, all parties agree that the settlement agreement and the terms of the settlement agreement shall not be disclosed to persons or entities not signatories to that settlement agreement, with the exception that any party to this lawsuit that is not a party to the settlement agreement shall be entitled to know the amount and terms of the settlement but shall not disclose that amount or terms to any person or entity not a party to this lawsuit. © 2016 Smith Moore Leatherwood LLP. ALL RIGHTS RESERVED. Practice Tips – Employer Confidentiality Agreements • Sample language (from SEC Cease & Desist Order): Nothing in this Confidentiality Statement prohibits me from reporting possible violations of federal law or regulation to any governmental agency or entity, including but not limited to the Department of Justice, the Securities and Exchange Commission, the Congress, and any agency Inspector General, or making other disclosures that are protected under the whistleblower provisions of federal law or regulation. I do not need the prior authorization of the Law Department to make any such reports or disclosures and I am not required to notify the company that I have made such reports or disclosures. © 2016 Smith Moore Leatherwood LLP. ALL RIGHTS RESERVED. Given What We’ve Learned, Is this Protected? © 2016 Smith Moore Leatherwood LLP. ALL RIGHTS RESERVED. How About This? © 2016 Smith Moore Leatherwood LLP. ALL RIGHTS RESERVED. Hope Your CLE Was Great! © 2016 Smith Moore Leatherwood LLP. ALL RIGHTS RESERVED. Questions? © 2016 Smith Moore Leatherwood LLP. ALL RIGHTS RESERVED. Fred Wood Amber Duncan fred. [email protected] com amber. [email protected] com John Reis Tim Sparks john. [email protected] com tim. 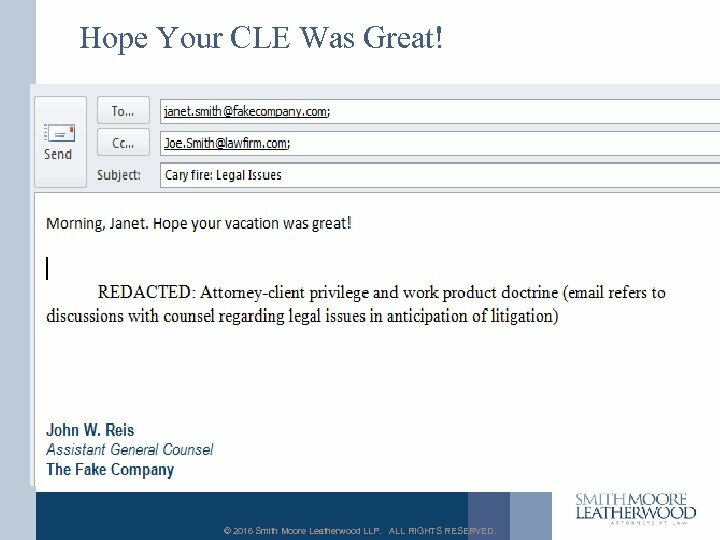 [email protected] com © 2016 Smith Moore Leatherwood LLP. ALL RIGHTS RESERVED.